If a toe deformity in children is found, carefully examine the hands and feet of the child and of the parents. These deformities are sometimes manifestations of a generalized disorder. This rare deformity is transmitted as an autosomal dominant trait, is bilateral, and often involves the hands and feet. A noninherited form is less common and is often unilateral. If it causes shoe-fitting problems, correct in late infancy or childhood by osteotomy and soft tissue approximation. Small toes are often found in Streeter dysplasia and may be secondary to intrauterine hypotension, causing insufficient circulation to the toes. No treatment is required. Syndactyly is most common between the second and third toes, is bilateral and often familial. Fusion of the toes produces no functional disability and treatment is unnecessary. Look for some underlying problem if it involves more than two locations. Polydactyly or supernumerary digits are common. They are most common in girls and in blacks. Most involve the little toe and duplication of the proximal phalanx with a block metatarsal or wide metatarsal head. Excise the extra digit late in the first year when the foot is large enough to make excision simple and before the infant is aware of the problem. Plan the procedure to minimize the scar, establish a normal foot contour, and avoid disturbing growth. Central duplications often cause permanent widening of the foot. Poor results are more likely for great toe duplications with persistent hallux varus and complex deformities. Curly toes are common in infancy and produce flexion and rotational deformities of the lesser toes. The deformity nearly always resolves spontaneously. Rarely, flexor tendinotomy is required for those that persist beyond age 4 years. Claw toes are associated with a cavus foot and are often secondary to a neurologic problem. Correction is usually part of the management of the cavus foot complex. Hammer toes are secondary to a fixed flexion deformity of the PIP joint. The distal joint may be fixed or flexible. The condition is often bilateral, familial, and most commonly involves the second toes and less frequently the third and fourth. Operative correction is indicated in adolescence if the deformity produces pain or shoe-fitting problems. Correct by releasing the flexor tendons and fusing the PIP joint. Mallet toes are due to a fixed flexion deformity of the DIP joint. These deformities are uncommon. Overlapping toes are common. Overlapping of the second, third, and fourth toes usually resolves with time. Overlapping of the fifth toe is more likely to be permanent and cause a problem with shoe fitting. 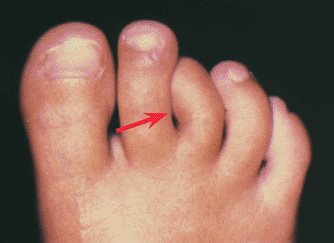 Overlapping of the fifth toe is often bilateral and familial. If overlapping becomes fixed, persists, and causes shoe-fitting problems, operative correction is appropriate. Correct with the Butler soft tissue alignment procedure. This involves a double racket-handle incision, lengthening of the extensor tendon, releasing the joint contracture, and skin repair with the toe translated to a more plantar and lateral position. Hypertrophy is seen in children with Proteus syndrome, neurofibromatosis, or vascular malformation, or it can occur as an isolated deformity. Most show abnormal accumulation of adipose tissue, and some show endoneural and perineural fibrosis and focal neural and vascular proliferation. Management is difficult. Epiphysiodesis, debulking, ray resection, and through-joint amputations are often necessary. Recurrence is frequent, and several procedures are often required during childhood to facilitate shoe fitting.